The CFX-65DZ has a 42 litre fridge and a 19 litre freezer function at the same time. 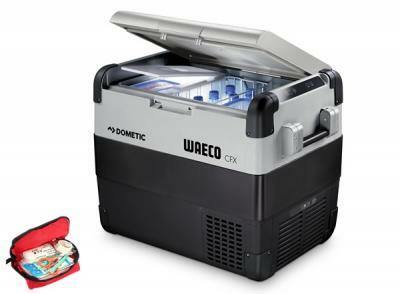 It comes with two baskets and a lid for the freezer compartment. The fridge compartment fits up to 60 cans and allows standard wine bottles to be stood up. It features a detachable lid (which can be flipped to allow opening from either side), an internal light, usb port, removable wire basket and spring loaded carrying handles. Weighing in at only 23.2kg, it is capable of maintaining temperatures from +10C to -22C. It comes with a 3 year warranty. Was a great experience recently in having one of these trailers for the weekend. They have a selection to choose from and Simon took me through the simple process of putting them up and down before we left. I had been looking to buy one, but had nowhere to store it. Hiring it was the best option. Thanks to the guys at Beans Offroad, for making the weekend memorable.